well the xonotic playerbase is rather small. if you stick around for sometime you will know where the people are from. Quote: well the xonotic playerbase is rather small. Word. It should be up to the user to decide to show their pride in a piece of coloured fabric, and that's what avatars and signatures are for, typically. "God save our gracious queen"
Would be nice if it's an option. It's just an extra piece of information that you can offer, I don't think that most people relate it with pride, same with age or gender. As an option ingame and on the forum - I'd like it. It would be nice so people woudn't need to put [PL], [US], [RU] and so on in their nicks - they could do it some other way. 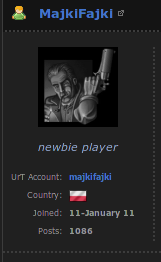 Btw: Nice to see more polish people out here on Xonotic forum.